You can find boats near almost everywhere where there is water, be it a river, a reservoir, a lake, a bay or an ocean. 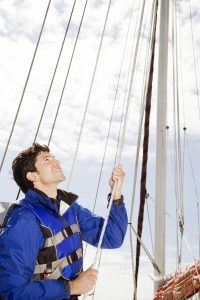 People that own boats typically belong to sailing clubs, where you can often find experienced sailors looking for crew members. A marina where people store boats is also a great place to look for experienced sailors. Finally, you can always look for a sailing school with professional instructors. Most boats that are longer than 5 yards (15 feet) were built for crews of more than one person. A boat that’s 30 feet long may need a crew of four or even more. This is why oftentimes finding someone you can sail with when you are just getting started is easier than in other kinds of sports and hobbies. Unless you are in Florida, California or other southern states, the sailors in your location most likely place their boats in storage and hide away their sailing clothes during winters. Assuming that you are not going to sail on an ice boat in frozen waters, there are two things that you will need to deal with: water conditions and wind conditions. Water conditions include waves, currents, the depth of the different parts of the body of water and temperature. Wind conditions include strength and change of direction. In some areas, a really windy spot and a calm location may be located less than a mile from each other. This is why learning more about your local conditions is so important. This is also something that you can get started with during any season, be it a warm summer or a really cold winter when nobody is sailing yet.